Ganesh Himal Base Camp Trek is a newly opened trek in restricted area. Nepal Government, Tourism Board of Nepal and Trekking Agencies’ Association of Nepal have recently promoted this trail as the next big thing in the field of trekking in Nepal. Bharal Adventure Pvt. is pleased to provide this splendid off the beaten trekking package. The journey starts from the green pastured meadows to the high altitude alpine belts. We will go through the multi ethnic community villages. Earlier the trekking in this trail used to be the camping trekking in Nepal. The construction and establishment of the lots of quality tea houses and guest houses have made it easy for the tea house trekking nowadays. The place is equally fascinating like the Annapurna Base Camp Trekking or Everest Base Camp Trekking but it has its own peculiarity. 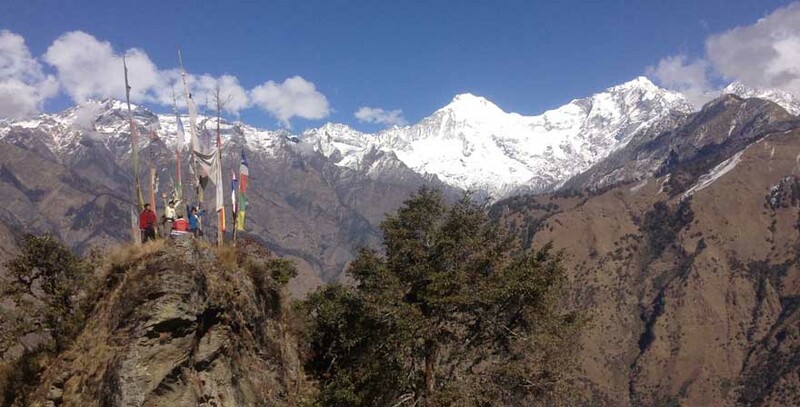 Trekkers will find the eternal peace and tranquility in the trail of the Ganesh Himal region. The first phase of the journey is the bus drive to the Somdang. It is the small Tamang Village. The place is popular for the zinc mine. Nowadays the micro hydro power projects and central main transmission line for the electricity have made even more sophisticated. However, the virginity of rural environment and natural setting is intact. The trip is holy in itself. Therefore your trip will have the spiritual value as well. The pangsang pass and single pass crossing as well as the spectacular view of the Himalayas would make you hypnotized to this place. Once you have been to Ganesh Himal Base Camp the trail descends towards the Rajgang Kharka. The trekking ends in Aarughat the small vibrant town in the border of Dhadingand Gorkha district of Nepal. Book the amazing trekking in Nepal packages with us. Bharal Adventure Pvt. Ltd. will do utmost best to ensure that Ganesh Himal Base Camp Trek will be the most cherished trekking of your life. Day 01: Arrival in Kathmandu 1340m. Day 02: Full day Sightseeing tour around Kathmandu valley 1340m. Day 03: Drive from Kathmandu to Samari Bhanjyang(1250m.) via Trishuli Bazaar (540m.) by bus. Day 18: Trek from Budathum to Arughat Bazaar (500m.) takes about two hours. Day 19: Final departure from Kathmandu. Bharal Adventure Pvt. 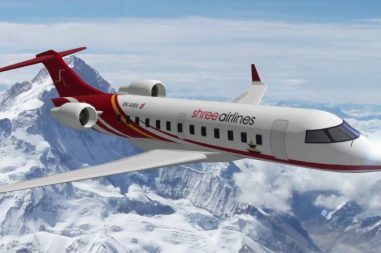 Ltd. airport representatives will receive you in an airport and transfer you to hotel in Kathmandu. Trip details will be discussed and final preparation is made with the trekking guide or leader. Pre-briefing with trekking guide, last minute shopping for your trip and Kathmandu valley sightseeing will be done in this day. The UNESCO WORLD HERITAGE SITES will be visited like Pashupatinath Temple, Boudhanath Stupa, Swaymbhunath (Monkey Temple) and Patan Durbar Square. Depart Kathmandu early morning for a 7-hour drive to the hill town of Sole Bazaar. Today you trace the route taken by king Prithvi Narayan Shah on his invasion march to Kathmandu over two centuries ago. Prithvi Narayan Shah is considered the founding father of modern Nepal, being the first person to assemble all the territories of the present country of Nepal under one ruler. En route you pass through Trisuli Bazaar, a small town that was once the hub for trekking in this region and is home to a small but interesting traditional bazaar. From here you travel on gravel road until you reach Samari Bhanjyang. This is a picturesque drive as you can see the beautiful scenery of rice terraces, small gorges and green hills. Samari Bhanjyang is a small town which was a trading place in the past. Stay overnight at camp in Samari Bhanjyang. In the beginning you trek along a gradually descending path until your trail turns uphill. Finally you trek through flat land to reach your destination. En route you pass different villages, forests covered with pine and rhododendron, farming terraces, small streams and numerous green hills. There is a small market in Katunje and you can have first glimpse of Ganesh Himal from here. Stay overnight at camp in Katunje Bazaar. In the beginning the trail goes downhill till Lapang. From there you will procede walking along the river bank until you reach Kintang Phedi. En route you pass several traditional villages, farming terraces, a fishing spot and beautiful green hills. Kintang Phedi lies at the bank of Netrawati or Ankhu Khola (stream). There are a few typical houses, shops with minimal supplies and terraces where local people grow potatoes and other food grains. Stay overnight at camp in Kintang Phedi. All the way, you trek on a gradually ascending path passing through several villages, farming terraces and green hills. The villages are predominantly inhabited by Tamangs, Brahmins and Chhetris respectively. Maize, millet, rice, wheat, buckwheat and green vegetables are the main staple food. Jharlang is a Tamang village where you find a government school and numerous typical houses. The main occupation of the locals is agriculture. Stay overnight at camp in Jharlang. You trek quite an ascending path until the trail levels out towards the ending point. While trekking you pass many Tamang villages. Borang and Shertum are among the famous Tamang villages. There are schools, a health post, chortens and mani walls in these Tamang villages. The main occupation of the people is farming. The scenic beauties you can behold are of green hills, terraces and villages at a far distance. Stay overnight at camp in Chalise. The early part of the trail goes downhill to Menchet Khola (stream) and after crossing this stream you trek steeply up and then gradually up to reach Hindung. This day you pass small Tamang villages, small forests, farming terraces and green hills. Hindung is a pretty big village mainly inhabited by Tamang. The main occupation is farming and the farmers grow potatoes, millet, barley, maize, beans and other vegetables. You find mani walls and prayer flags in some parts of the villages. One thing to notice is that it is the last village you pass while trekking to Ganesh Himal Base Camp. Stay overnight at camp in Hindung. After leaving Hindung you will rarely find terraces. The route up to Rajgang Kharka is ascending and flat as well. You walk along the trail covered with forests of rhododendron and local vegetation. These forests are the nestling places of various species of birds and wild animals. Rajgang Kharka is surrounded by beautiful forests and mainly with grassland. Except winter seaso, the local people bring domestic animals especially sheep for grazing. Stay overnight at camp in Rajgang Kharka. The trail is narrow and moves mostly uphill and leveled path in some places. You walk along the trail covered with forests for few hours. Towards the end, the trail moves along the land where you rarely find any trees. You find alpine grass here due to high altitude. At Kalo Seto Kunda there are two lakes of holy significance. The surface of Kalo or Black Lake is covered with black stones. On the contrary, the surface of Seto Kunda or White Lake is covered with white shinning stones. During winter season these lakes are frozen. Stay overnight at camp in Kalo Seto Kunda. You can have an excursion in and around Kalo Seto Kunda (Black and White Lake). 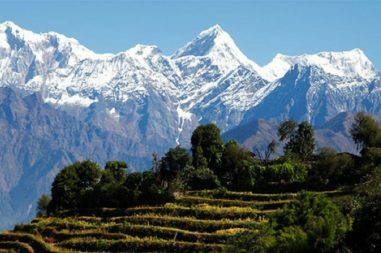 From here you can enjoy the majestic views of Ganesh Himal, Paldor Himal and many others. Stay overnight at camp in Base Camp. Trek from Ganesh Himal Base Camp to Rajgang Kharka takes about six hours. You trek along the descending and narrow path where you find alpine grass on both sides. Stay overnight at camp in Rajgang Kharka. You trek downhill all the way to Laba Besi and then turn uphill to reach Laba village. This day you pass pine forests, Tamang villages, farming terraces, green hills and villages at far distance. Laba is a beautiful Gurung village with its own tradition and culture. Stay overnight at camp in Laba Village. This day you trek through beautiful rhododendron and pine forests. These forests are the home of various species of birds and wild animals. The trail moves up hill all the way to Manyang Bhanjyang. From here you can see the first glimpse of Ganesh Himal. While trekking you pass Khading village mainly resided by Tamang and Gurung. The main crop is potatoes here. Manyang Bhanjyang is a ridge where you will find forests and grassland. This is a perfect place for camping as your camping site is surrounded by rhododendron and oak forests. Stay overnight at camp in Manyang Bhanjyang. To reach Majhgaun you have to trek along a gradually descending path and after some time a steeply descending path. On the way you pass forests of rhododendron and oak, villages, farming terraces and green hills. This day you are quite captivated by the clear views of the Manaslu range, including Buddha peak on a clear weather day, along with other unnamed mountains and peaks. As you enter Majhgaun you will find local people being engaged in farming but it is reported that some people have migrated either to foreign countries or Kathmandu. Stay overnight at camp in Majhgaun. You walk along the trail dominated with villages, forests, streams and terraces. This day you can enjoy the scenic beauty of green hills. Budathum is a small town with a local old market. This village is predominately inhabited by the Newar community. From here you can enjoy the spectacular views of the Manaslu range at a far distance. Stay overnight at camp in Budathum. On this same day you drive back to Kathmandu. To reach Arughat Bazaar you trek a descending path which then levels out. On the way, you pass a few streams, villages, farming terraces and small forests. Here, you find shops with minimal supplies, a motor able road, high school, health post, typical tea houses, small lodges and it lies at the bank of the Budhi Gandaki river. Here, the route to Manaslu trek meets. You board your vehicle at Arughat Bazaar to reach Kathmandu. The amazing Nepal trekking ends once we bid farewell. Our Airport Representatives will take you to Airport and with promise to meet again we bid farewell. Bharal Adventure is always there for the best arrangement of your holidays. Please use this checklist as a guideline for getting information on the required equipment to carry on a trekking. Adjustments could be made to the list according to your needs, interest and duration and season of the trip among other factors. The variety of these gears could be hired or bought in Kathmandu. Since the majority of these gears found for sale in Kathmandu are locally manufactured, they are a lot cheaper. some gears are imported from Chinawhich of better quality. If you have enough money, you can buy very high quality branded gears too, in some of the famous stores in Nepal. It is advised that you keep your luggage as light as possible. You extra luggage could be left back in your hotel in Kathmandu which you can claim back at your return. We normally provide one porter for two trekkers to carry the luggage and the limitation of the weight is approximately 25 kg from two people. TIMS (Trekking Information Management System) Card for the Trekking region.